Paradise Slimming Spa is a pioneer in Health sector in Chandigarh and Mohali region and providing various best services to every individual in this area. 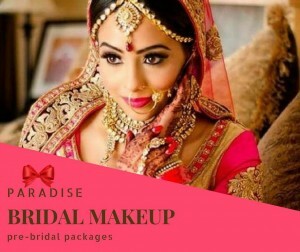 The wedding is the most important Occasion for any women and if you seem to be confused about the look you should have for your wedding or a friend’s wedding party then come to Paradise slimming spa centre which provide Best Bridal Makeup in Chandigarh and be prepared to rock the party floor where ever you go. We make sure your make-up compliments your dress and you set the party on fire. The highly skilled and trained staff delivers the best beauty services that include bridal makeup, makeovers, hair styles, nail art and many more services at Paradise Slimming Spa centre in Chandigarh, Mohali.